Mývatn in Icelandic means the lake of midges, and it comes from the large amount of midges that reside here each summer. Mývatn is a large lake at the North-Eastern part of Iceland, it is 37 km2 and has around 40 small islands in its middle. The lake was formed around 2300 years ago from a large fissure eruption that poured out basalt lava. Because of the volcanic origin there are silica quarries throughout the lake, which gives the water its beautiful colour. Mývatn is paradise to bird watchers. There are 14 species of duck birds here, which is quite rare! The species show a unique mixture of Eurasian and North American characteristics, both boreal and arctic. This area gives its visitors unspoiled scenery and breathtaking landscapes. The lagoon here is as blue as the Blue Lagoon in the South. 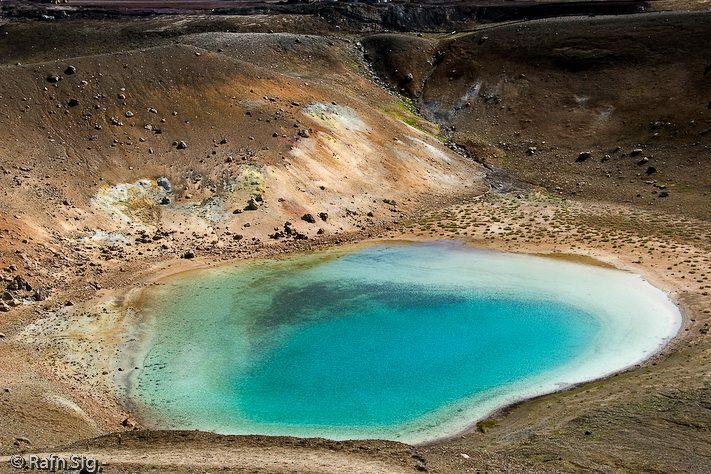 Lake Mývatn geothermal area is the lagoon of choice in the North. Explore Mývatn on our incredible Magical Mývatn expedition!